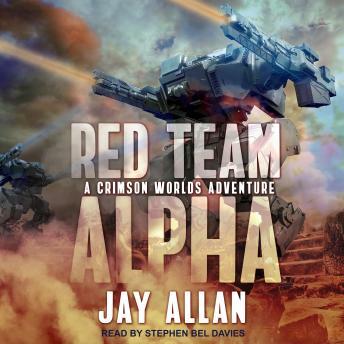 Red Team Alpha. An elite military unit. Twenty highly trained veteran warriors, Mars's best. They are capable, dedicated, armed with the best technology Mars has to offer. And they don't exist, at least not officially. Now the team will be called upon to face its greatest test. On a planet in a newly discovered system there is a mysterious wreck, the remains of an ancient ship. The discovery is a momentous one, first contact and proof that mankind is not alone in the universe. It is a job for the Team, but even these crack soldiers will be tested to the limit of their abilities as they uncover the dark horror within, a technological nightmare that threatens the very future of humanity. The soldiers of Alpha will fight, ignoring the odds as usual, but this time they will be caught between two enemies. For they are not the only ones who know about the ruins. Even now, the notorious Gavin Stark and his Alliance Intelligence forces are on the move, seeking to seize the ancient vessel and the priceless technology within for their own purposes. And they are ready to do whatever is necessary to gain the priceless ship . . . including wiping out Red Team Alpha completely.